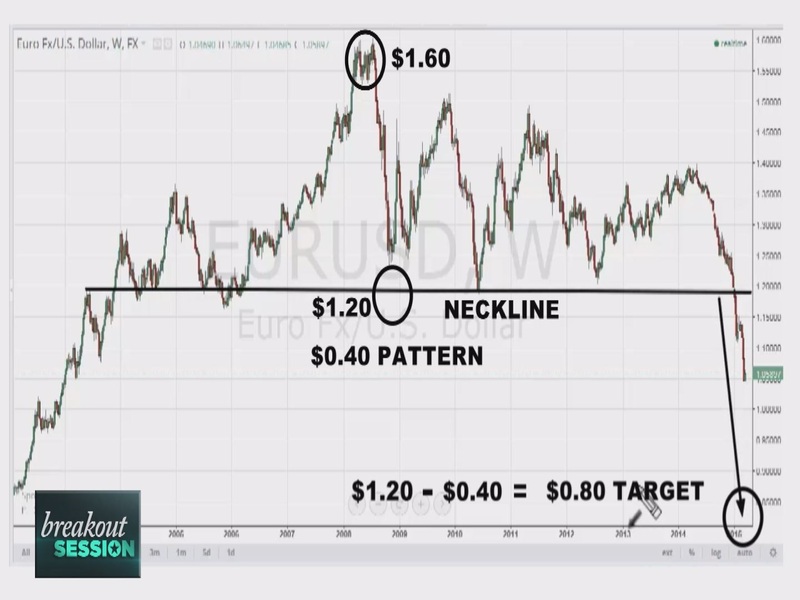 Rekord mycket kortningar i Euro och Guld. According to the Monthly Wholesales Report, inventories were up 6.2 percent in January from a year ago and 0.3 percent from December. Coupled with weak sales data (sales fell by 3.1 percent from December 2014 and 1 percent from January 2014), the inventory to sales ratio increased to 1.35 in January from 1.33 in December 2014. It means that it would take 1.35 months for businesses to clear shelves, the highest inventory-to-sales ratio since July 2009. Why is data on business inventories so important? The answer is that the changes in the inventory to sales ratio indicate any supply or demand imbalances in the economy. Inventories rise when supply is greater than demand. Inventories rising relative to sales mean that sales fail to meet demand projections. 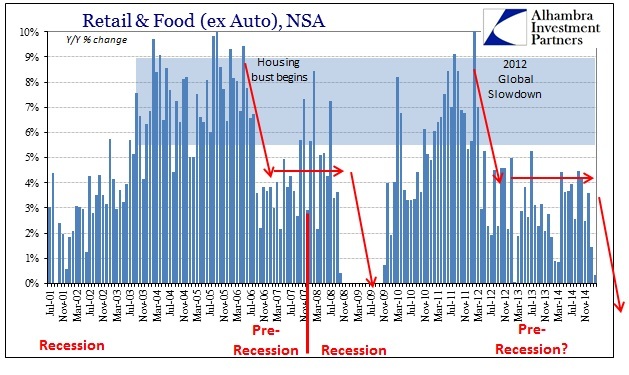 Thus, the inventory to sales ratio usually reaches its cyclical peak in the middle of the recession, when the economy is slowing down. Indeed, please note three things. First, that inventories of durable goods jumped the most – by 7.7 percent from year ago, which is generally in line with weak data on news orders for durable goods. Second, contrary to the historical declining trend (due to improved inventory management), we are witnessing a gradual rise since 2013 and particularly since the summer of 2014. 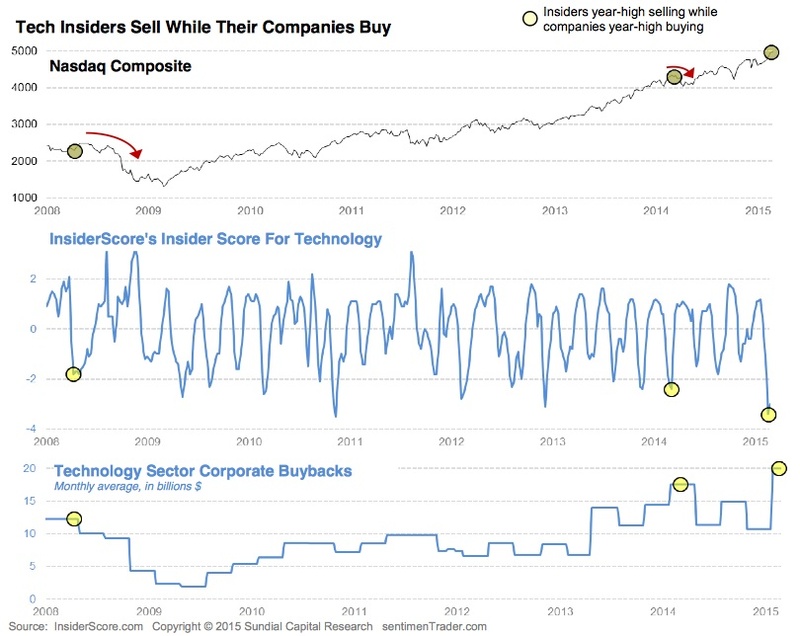 Actually, the inventory to sales ratio has reached the highest level since the Great Recession (see the chart below). Third, inventories are rising despite low prices. Thus, this indicates week global demand. Nästan 3 triljoner av skulder i Europa handlas nu med negativ ränta. Hur länge till kan ett kapitalistiskt system handlas med negativ ränta och hur skall detta sluta. Enligt The Telegraph håller nu banksystemet i Andorra på att fallera. Kommer vi se en Bail In samma som dom nu förbereder i Österrike. 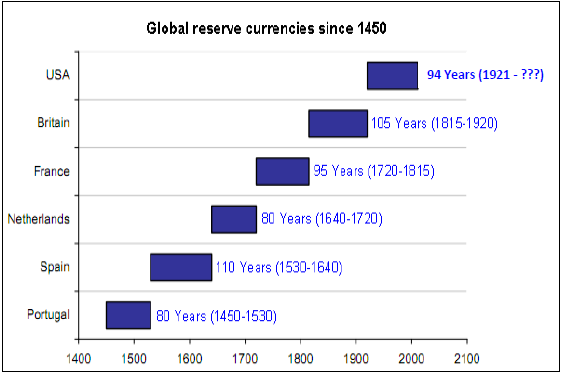 Examine the 25 year graph of the XAU. 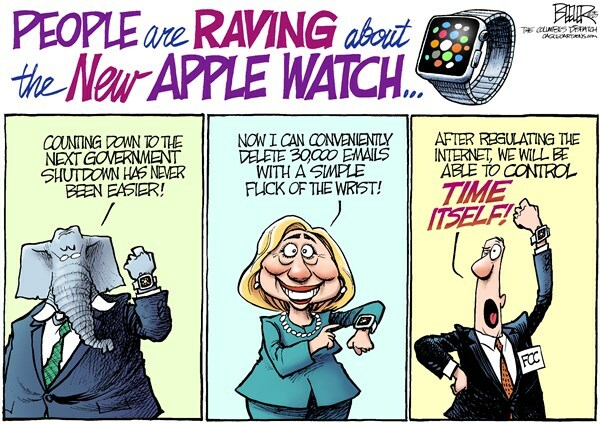 The chart has been rising slowly but is currently deeply over-sold. The S&P 500 Index (not shown) has rallied to new highs, looks toppy, and has been levitated by “money printing” and low interest rates. 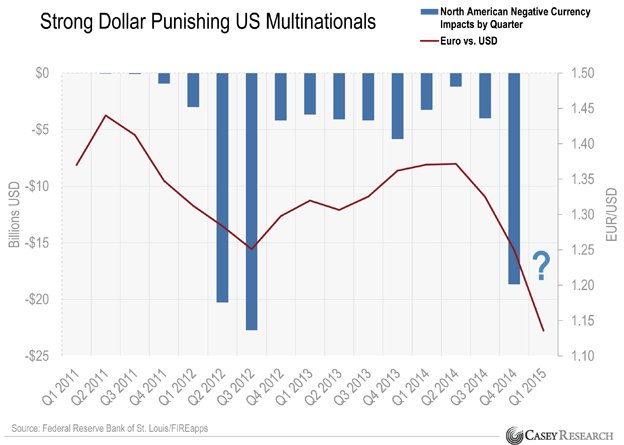 Examine the graph of the ratio between the XAU and the S&P. The ratio is currently at lows last seen in 2000 and is near all-time lows. 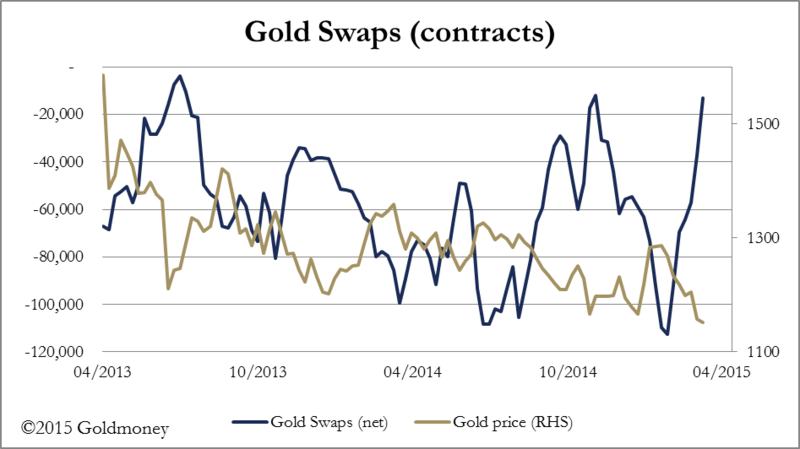 Gold and silver prices have been weak for four years and the XAU has been crushed further. Expect gold, silver, their stocks, and their ratio to the S&P to rally in 2015 and 2016. 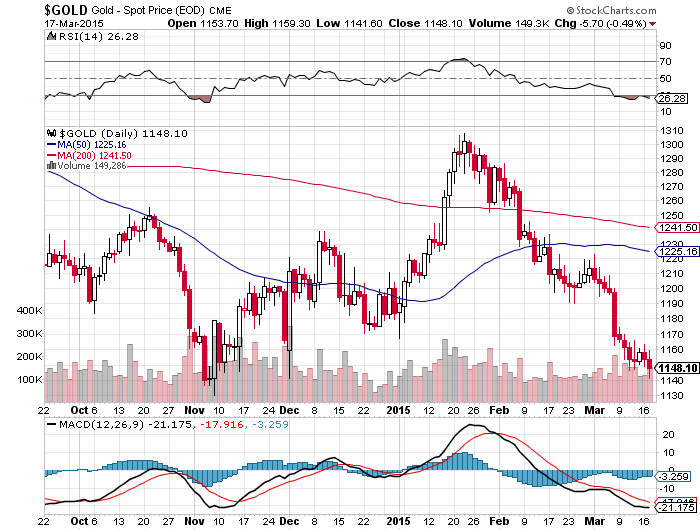 Have gold stocks fallen in tandem with gold prices? No! Examine the chart of the XAU to Gold ratio. It peaked in 1996 and has fallen since then. 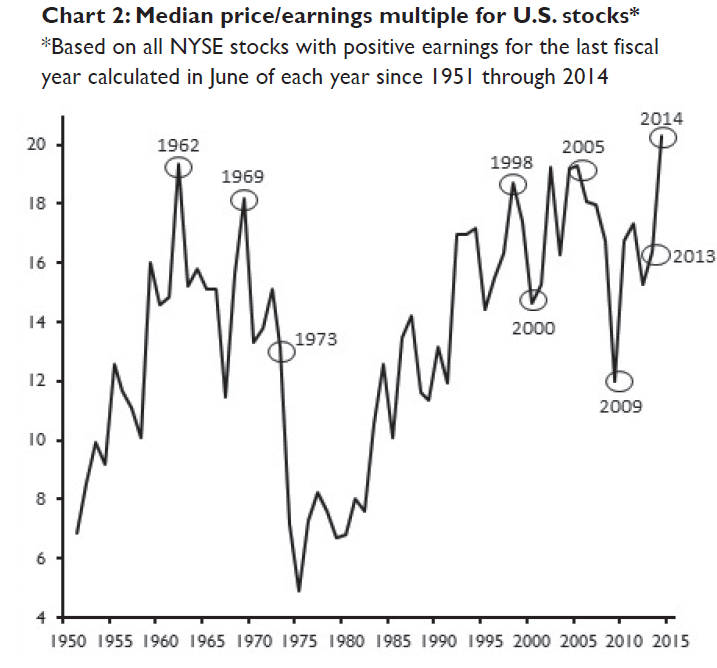 Gold and silver stocks have been “out of favor” for nearly two decades. The ratio hit a low in November of last year and is still exceptionally weak. Expect a rally. Det som amerikanarna sparar på lägre bensinpriser går till ökade sjukvårdskostnader för Obamacare och inte till mera shopping som många tror. After rising at an annualized pace of 4.6% and 5.0% in Q2 and Q3, the final Q4 GDP estimate (a number which will still be revised at least 3-4 times in the coming years), slid more than half to 2.2%, the same as the second estimate from a month ago, and below the consensus Wall Street estimate of 2.4%. Following the release of the Federal Open Market Committee (FOMC) minutes last week, gold and silver have come alive, the gold price rising from a low of $1147 on 18th March to $1200 this morning and silver from $15.46 to $17.00, 4% and 10% increases respectively. The Commodity Futures trading Commission's (CFTC) Commitment of Traders Report released last Friday conveniently shows the positions of trading categories the night before the FOMC minutes were released. 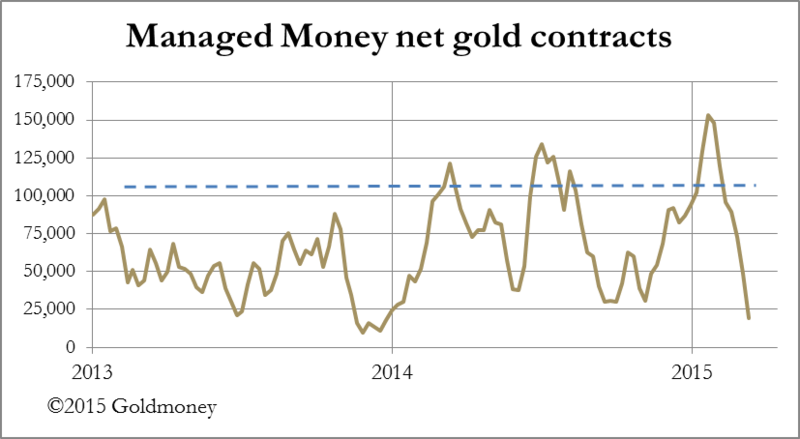 In gold, the Managed Money category sold down their positions to the lowest net long position since December 2013. This is shown in the chart below, with the dotted line representing the average net long position since 2006. This represents a dramatic turnaround in positions, and it has permitted the Swaps (mostly bullion banks) category to reduce its net short position substantially, shown in the next chart. This confirms that the Managed Money category, consisting mostly of hedge funds, was badly wrong-footed ahead of the FOMC release, being very short indeed. 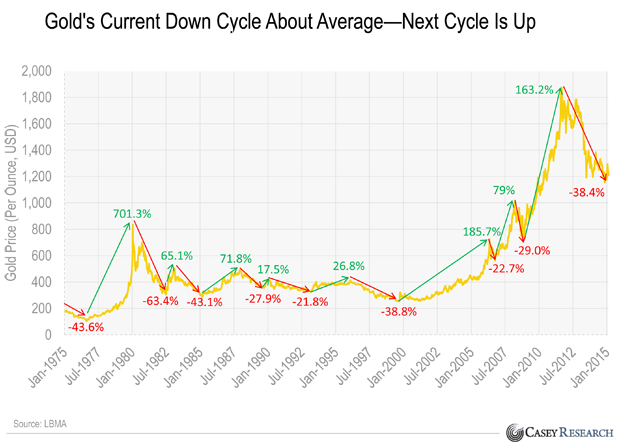 In other words, there has been a significant bear squeeze subsequently which has driven the gold price sharply higher. A simple bear squeeze should be accompanied by a decline in Open Interest, because a bear squeeze forces wrong-footed traders to close their loss-making positions. However, Open Interest has been increasing, which it turns out is entirely due to an increase in spreads1. Since Wednesday, Open Interest has declined sharply, which suggests that spread positions have been closed as the April contract runs off the board. This is shown in the next chart. The presence of spreads, which are neither bullish nor bearish, negates the hope that the recent increase in Open Interest is due to genuine demand. Instead, we must conclude that dollar weakness after a period of significant strength has much to do with the rise. 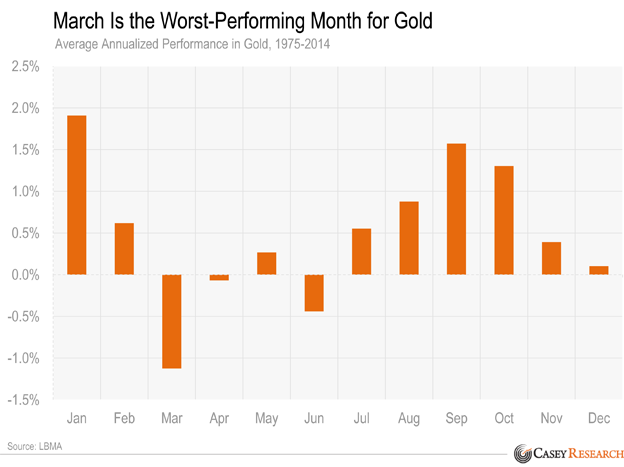 Oil prices have rallied strongly as well, having been oversold, confirming that markets so far appear to be only correcting the moves of the last eight weeks. 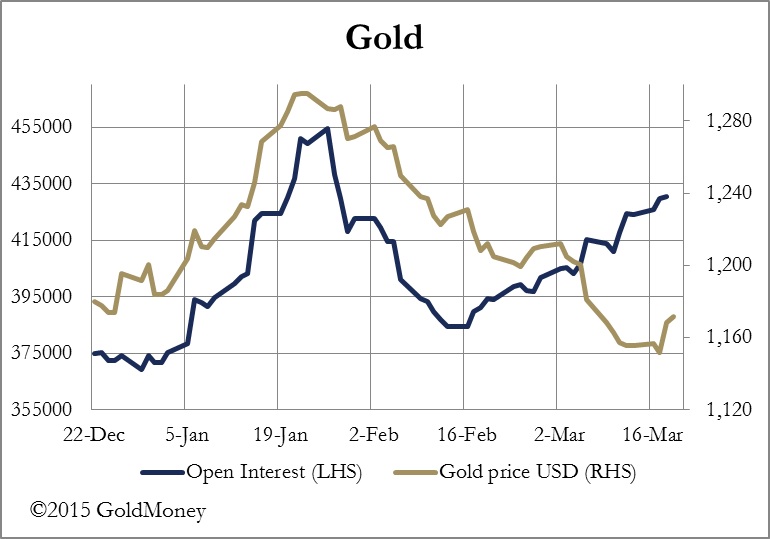 However, there are fundamental reasons for a more bullish stance for gold, not least the dawning realisation that the FOMC minutes from last week effectively put off interest rate increases indefinitely. 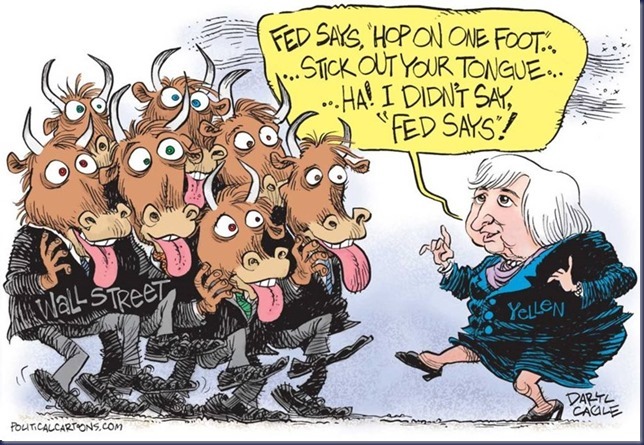 Whatever else is a threat to the world's financial credibility, and you could make a very long list of those, the Fed's admission that for the foreseeable future there is no exit from continuing monetary inflation fully justifies a more positive trend for precious metal prices. The Shanghai Gold Exchange delivered 53.47 tonnes into public hands last week, making a total of 561 tonnes so far this year, a slight increase on last year. 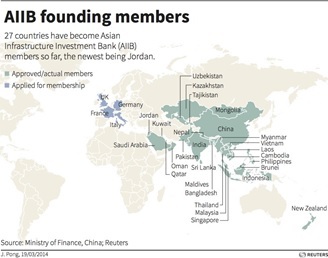 Den Asiatiska Banken AIIB växer så det knakar nu är det 27 länder som medlemmar. Man undrar hur dollarn ställer sig detta. Atlanta FED bedömer nu att BNP Q! för USA inte kommer upp till mer än strax över nollan. Man började året med en bit över 2%. Det går fort när det börjar gå utför. Lyssna på Alasdair Macleod när han gästar Greg Hunter. Mycket bra Podcast. Deutsche Bank Securities Chief International Economist Torsten Sløk sent out a chart today that crisply shows how the Fed is becoming more and more pessimistic as time goes on. 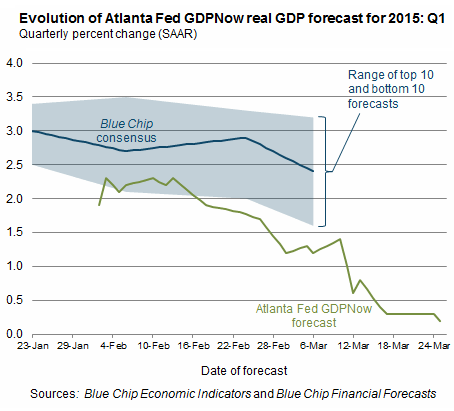 You can see the recent projections in the dark blue line. Grekland har ett jobbigt år i år när det gäller att amortera på sina skulder. Det är svårt att ycka år från en flintskallig. Det finns dom som tror att dollarn är stark för att vi har en stark tillväxt i USA. Chinese rail freight collapses 9.1% YoY; China Manufacturing PMI tumbled back to a contractionary 49.2 - lowest in 11 months; and the Employment sub-index plunged to its lowest since Lehman ... yeah but apart from that, everything is awesome. And for those excited about just how disastrous Chinese data is (and thus how huge the next stimulus unleashing will be), think again - China now sees exactly where the last trillion dollar QE went... a de minimus and unsustained blip in the economy and liquidity-fueled rampage in stocks (which is not what a corruption-crackdown politburo wants to encourage). Under vecka 10 tog man ut 51 ton guld från SGE vilket tyder på fortsatt stort intresse för fysiskt guld. 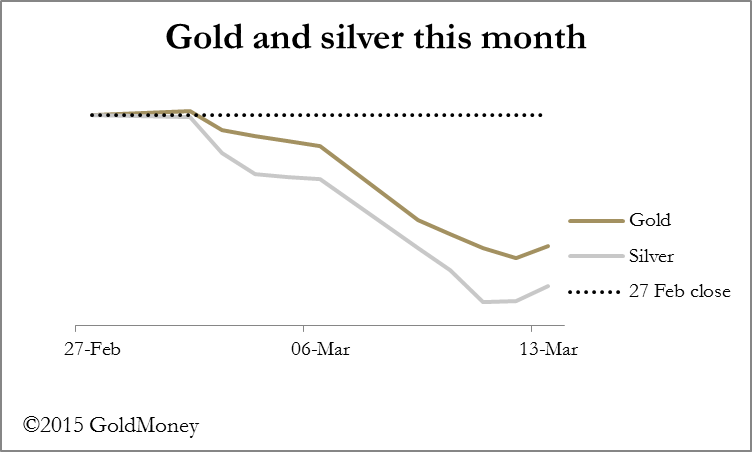 Withdrawals from the Shanghai Gold exchange (SGE), which equal Chinese wholesale gold demand, in week 10 (March 9 – 13) accounted for 51 tonnes. Year to date total withdrawals have reached 508 tonnes. Vi är nu på nivåer där 1% av befolkningen i USA tar hem alldeles för mycket pengar. The Federal Open Market Committee (FOMC) statement released on Wednesday was notable for deferring interest rate rises to some unspecified time in the future. This was realistic, given the continuing strength of the dollar, downward revisions to the inflation outlook, and economic weakness in virtually all industry surveys. The Fed's obvious problem in deferring a rise in interest rates is the continuing improvement in the unemployment statistics. However these are seriously flawed: for example in February housing starts fell sharply due to the bad weather, yet seasonally adjusted non-farm payrolls for residential construction jobs were said to rise by 17,200. It appears the Fed is boxed in, and raising the Fed funds rate would probably only serve to increase excess reserves. 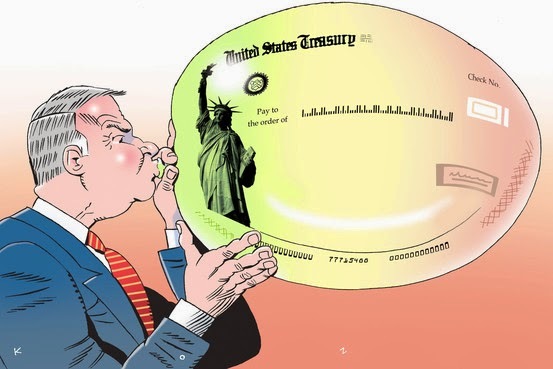 If so, the Fed would have to shell out interest payments to the banks at a rate it really cannot afford, given its own balance sheet is geared over 70 times. 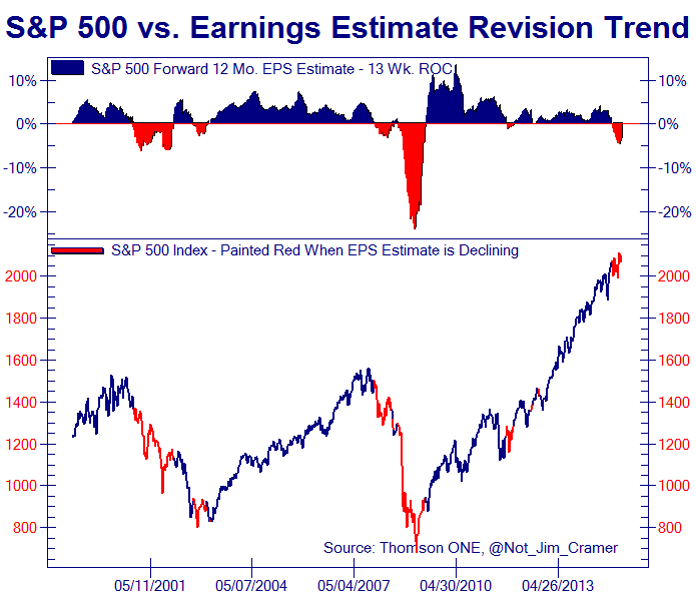 Markets seem to be slow to understand this problem: if the Fed is unable to raise interest rates (i.e. 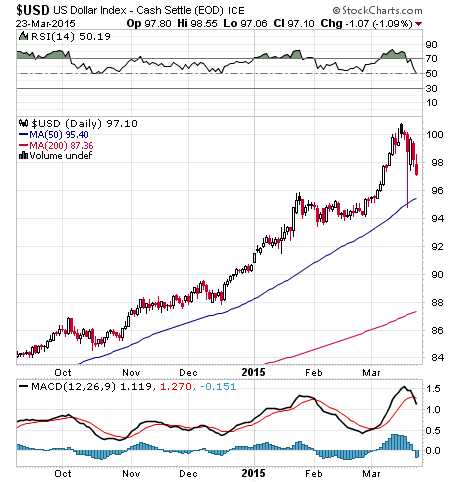 the Fed funds rate) the dollar itself is at risk. 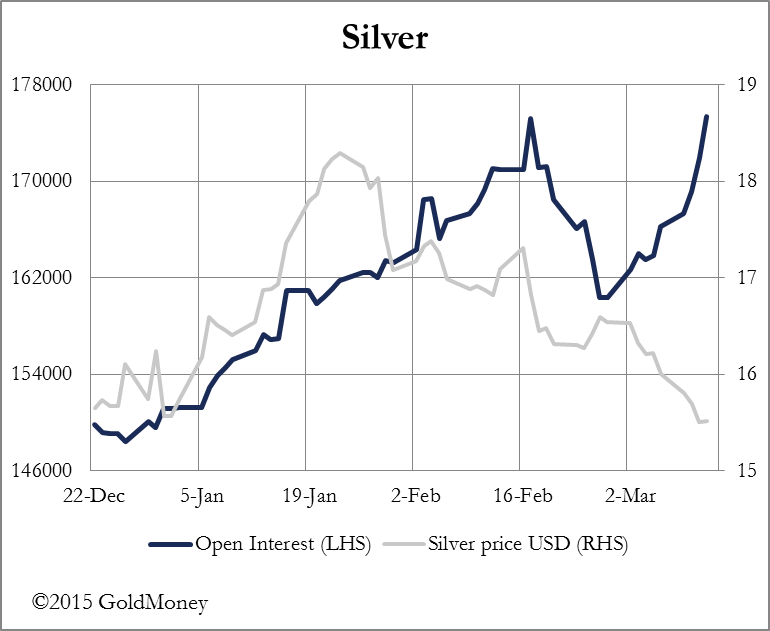 The immediate effect on precious metal prices was to turn them sharply higher, and Open Interest on Comex has continued to climb. Gold was up a net $16 on the week and silver $0.55. Oversold currencies bounced strongly, but gave back most of their gains yesterday. The set-up is now for a bear squeeze in gold and silver, with the Managed Money category on Comex somewhat short. 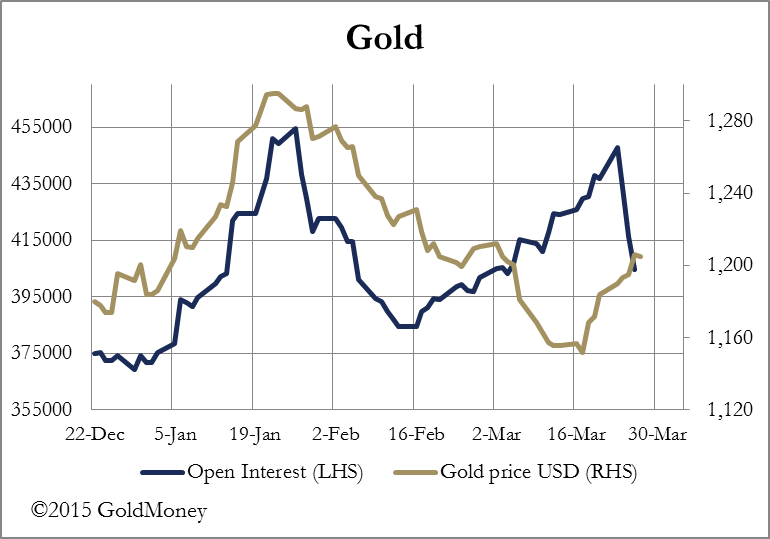 The chart for gold and its Open Interest is shown below. 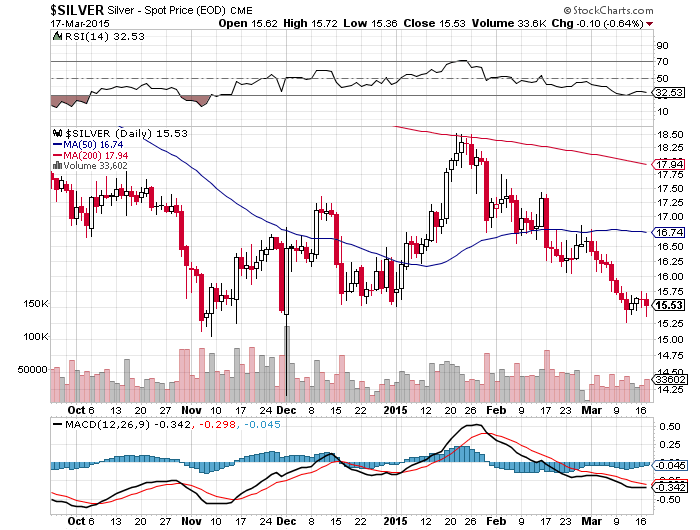 Silver has continued to resist moves to the downside, and here the Open Interest has continued its climb as well. 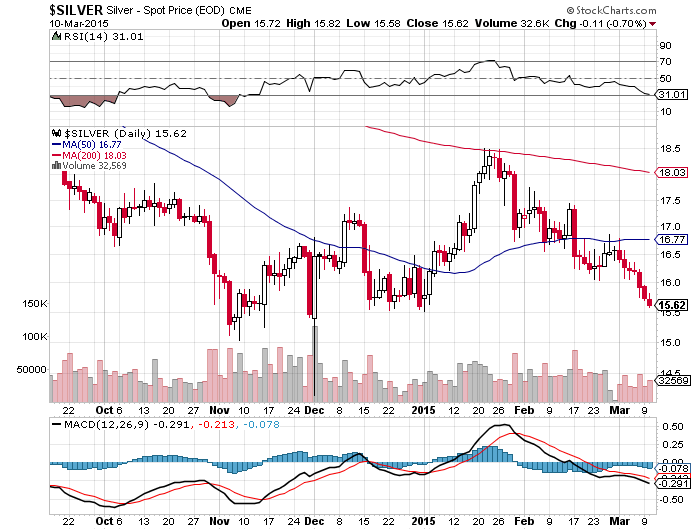 Silver has outperformed gold, illustrated in the chart at the head of this report. Normally falling prices are accompanied by lower Open Interest. 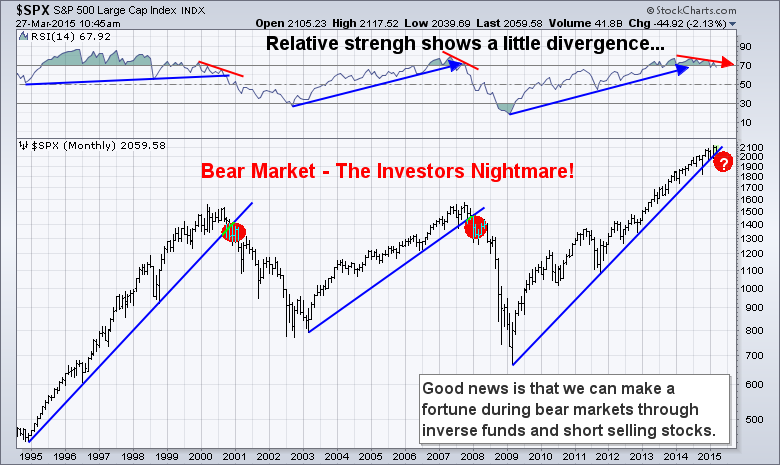 The current divergence is therefore indicative of increased buying support, which may be enough to reverse the bear trend of the last three years. It has been a momentous week, and rarely do so many important events occur. 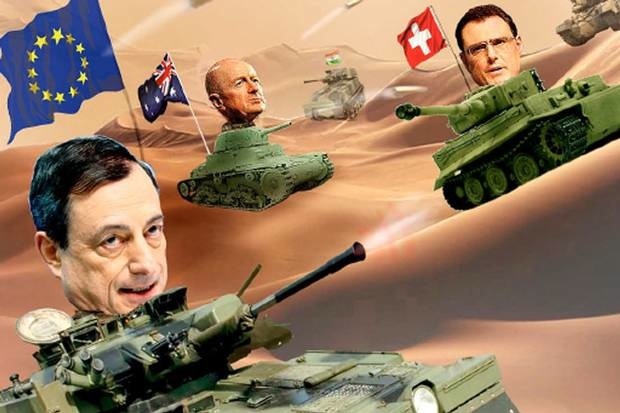 As well as the Fed showing they dare not or cannot raise interest rates, Greece's negotiations with the other Eurozone members are stranded on the rocks of reality. This was the week when markets suddenly realised the UK faces a general election with considerable political risk so sterling was sold heavily. The UK, Germany, France, Italy, Luxembourg and Switzerland are queuing up with probably Australia and New Zealand to become members of the Chinese and Russian led Asian Infrastructure Investment Bank, compromising NATO and Pacific alliances. 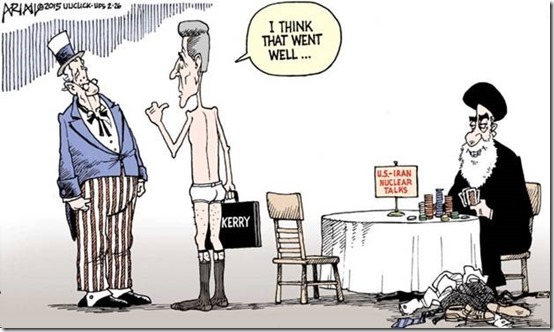 Unfortunately for American hegemony, the political line-up is following an economic interest, and this is a party to which America does not have an invitation. If all that is not enough, the London gold fix changes this morning after ninety-six years from a committee to a platform run by the International Commodity Exchange. Participants (the approximate equivalent of market makers) announced so far are Barclays, HSBC, Scotiabank, Société Generale and UBS. It is interesting that the American and Chinese houses are holding back. 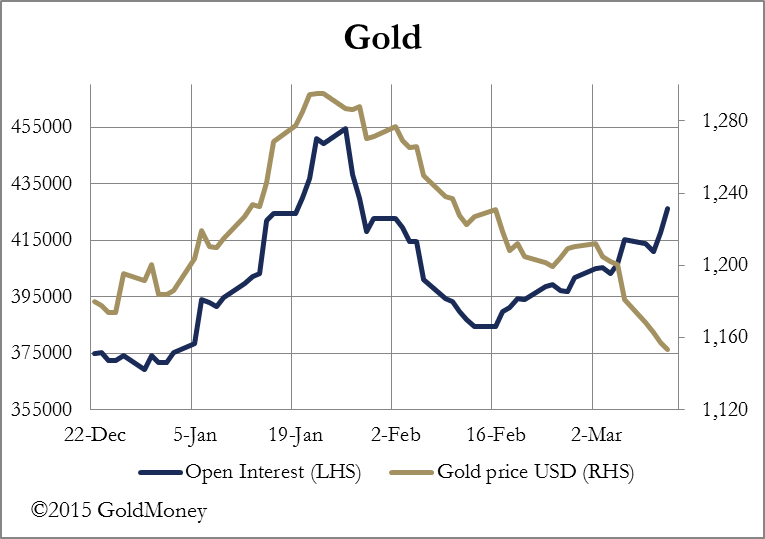 GoldMoney's customers sat on their hands ahead of the FOMC announcement, turning buyers after the event, according to our dealing desk. Wholesale gold bullion deliveries from the Shanghai Gold Exchange amounted to 51.456 tonnes last week, totalling 507.71 tonnes since 1st January. 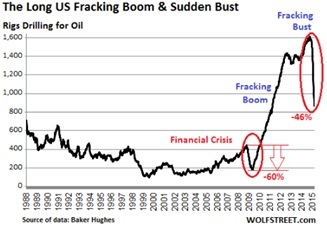 Hur många shale oil bolag kommer och överleva och hur mycket kommer bankerna att förlora. Volatiliteten på valutamarknaden är nu vildare än på någon annan marknad. Frågan är hur man skall få stopp på uppgången i dollarn som sedan förra sommaren stigit snabbare än någon annan gång under perioden med fiat valutor. Det beräknas att det finns ca 9 trilljoner dollar som är placerade runt om i världen och således har sålts mot andra valutor. 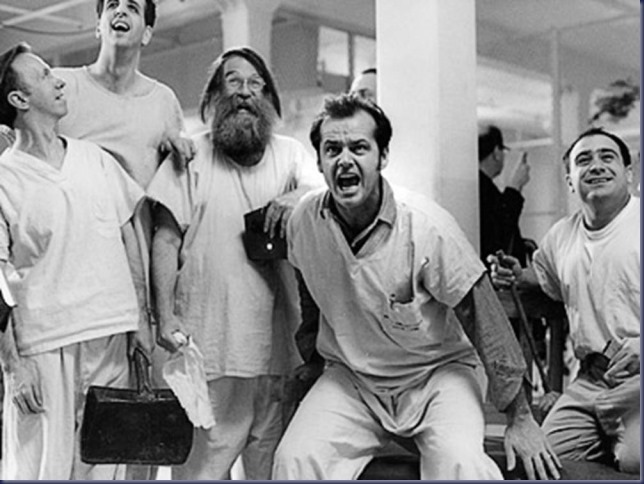 När nu stora valutaförluster uppstår och dollar måste köpas tillbaka till högre kurser så är det svårt att få ned dollarn och minska det deflationistiska trycket som uppstår i USA och på råvarumarknaden. FED är nöjda över gårdagens besked. USA på väg in i en ny lågkonjunktur?????? 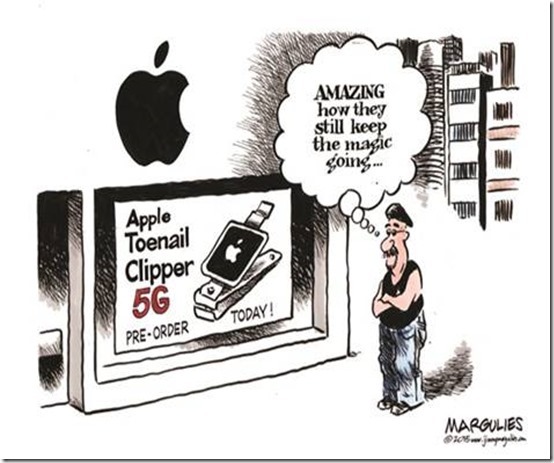 Consumer consumption represents about 2/3rds of the U.S. economy. 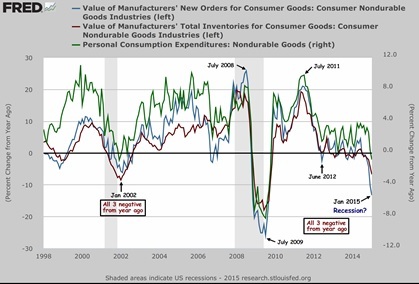 No matter what you look at, actual consumption, inventories or new orders, they are all in decline. 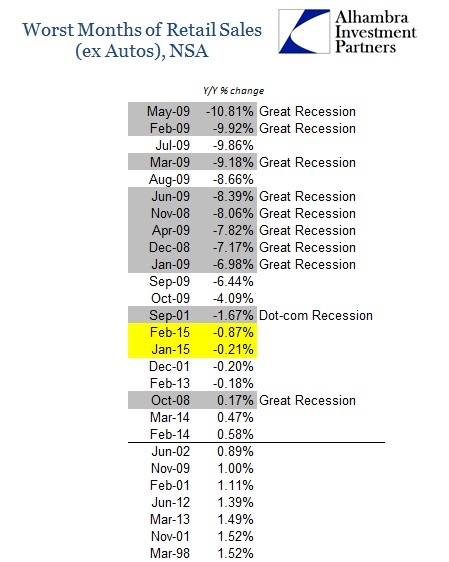 The last two times all three series went negative in unison the U.S. was already well into recession. Svårt att se var tillväxten i USA skall komma från då lönerna inte ökar och det är färre som jobbar. FED har mindre och mindre att säga. Det blir oftast så när man har målat in sig i ett hörn. HY marknaden nu och vid förra kraschen 2008. Gapet skall stängas antingen genom lägre HY räntor eller att S&P skall ned. Det är bara o välja. Credit sector officials estimated that the flight of deposits yesterday alone amounted to 350-400 million euros, which was some five times higher than the daily average in previous days. They added that Wednesday’s withdrawals totaled the most since an agreement was reached at the February 20 Eurogroup meeting. Hur skall det här gapet stängas, guldet upp eller FEDs balansräkning kommer att krympa. Det är bara o välja. This chart compares the monthly percentage growth of the Federal Reserve balance sheet (U.S. Treasuries and Agency MBS) against the price of gold back to 2004. Kommer IMF ändra förutsättningarna för dollarn under hösten. IMFs valuta SDR kommer förmodligen spela en större roll inom det monetära systemet. Idag består SDR av fyra valutor, USD andel 41,9%, Euro 37,4%, Pound 11,3% och Yen 9,4%. Vart femte år tar IMF upp vilka valutor som skall ingå och vilken andel de skall ha inom SDR. För att klara kraven skall valutan handlas fritt på världsmarknaden och vara en exportrelaterad valuta. Senaste mötet 2010 togs Kinas eventuella medverkan upp men Yuanen ansågs då inte vara tillräkligt handlad som fri valuta men uppfyllde kraven som export relaterad valuta. Vid årets möte den 9-11 oktober kommer Kinas ansökan att behandlas än en gång och mycket tyder på att den här gången kommer det bli ett positivt besked. De finns också dom som tror att SDR kommer att utökas med ytterliggare två valutor, CHF Schweiz och CAD Kanada så att det totala antal valutor som ingår blir sju. Om nu Kina släpper peggen mot dollarn eller utökar banden som valutan får fluktuera inom är det ett tecken på att dom förbereder sig för SDR vilket med all sannolikhet innebär att man kommer att meddela hur mycket guld Public Bank of China har i sin ägo. Bör vara upp mot 5 000 ton guld för att vara ungefär lika mycket som USA och EU har i förhållande till BNP, ca "2%. Finns även de som tror att guldet kommer få en roll för att backa upp valutorna som skall ingå i SDR. Oavsett så är detta mycket positivt för guldet och det kommer också innebära att det blir mindre intresse av att hålla dollar och därmed kommer dollarn att devalveras mot andra valutor samtidigt som guldet går upp. 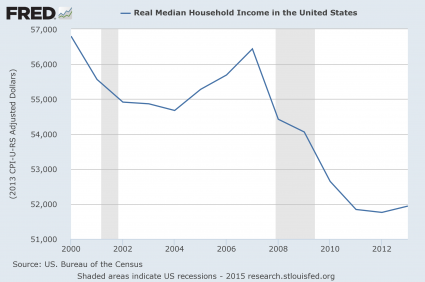 Detta är nog mycket efterlängtat från USA då den starkare dollarn gör det svårare för FED att uppnå 2% inflation. Lägre dollar innebär högre råvarupriser och framförallt högre guld och silverpris. Möjligen ser vi botten för råvaruindex under våren/sommaren. Housing Starts for February collapsed 17% - this is the biggest MoM percentage drop since February 2011, and at -184K units down, this was the single biggest monthly decline in absolute terms since January 2007! At 897k SAAR, this is the first sub-900k print since September 2013 and biggest miss since Feb 2007. Multi-family starts are the lowest since June 2014. The collapse was dominated by the Northeast (-56.5%) and Midwest (-37%) so it must be the weather, right? Not so fast, The West region saw starts collapse 18.2%. 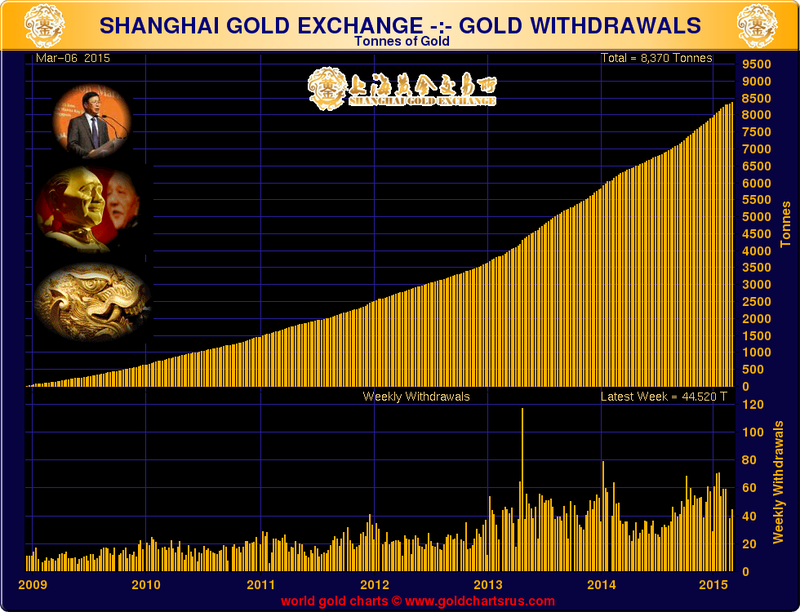 The withdrawals from the Shanghai Gold Exchange for the week ending March 6. The magic number was 44.520 tonnes. Euron är nu kraftigt översåld kan vi få en rekyl redan på onsdag då FED avvaktar med besked om eventuell räntehöjning. 1. 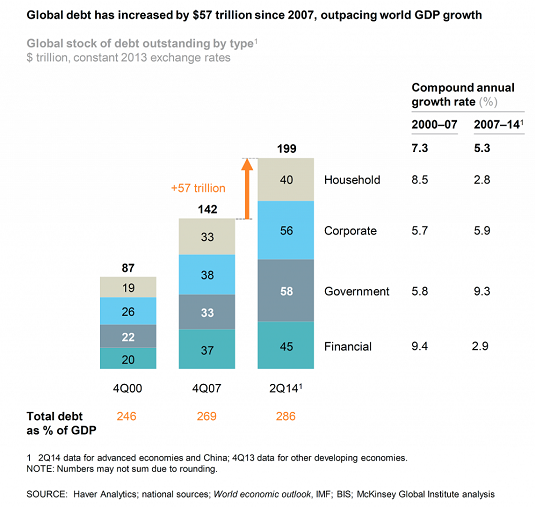 Can the U.S. economy decouple from the global economy, i.e. 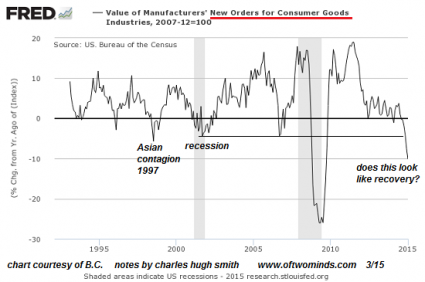 keep expanding production, sales, income and payrolls while the rest of the global economy falters? 2. What happens to the U.S. stock market if/when the U.S. follows the rest of the world into recession?" FED har målat in sig i ett hörn frågan är hur dom skall komma ut. Får vi besked på onsdag. Är S&P 500 på väg mot 1750. 46 miljoner människor erhåller food stamps i USA. Är verkligen ekonomin på gång som dom påstår i media. 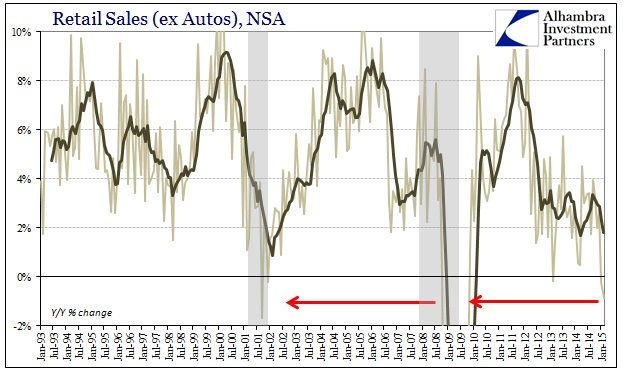 Retail Sales ex Autos fortsätter ned i USA och vi närmar oss nu en klar recession. Kan börsen gå emot en nedgång i ekonomin och kan FED höja räntan. Börserna i Europa stiger kraftigt då ECBs QE förväntas öka vinsterna. Varför kommer det att bli så inom EU när det inte har lyckats någon annanstans. .
Vi har varit med om detta förut och det slutade inte väl. 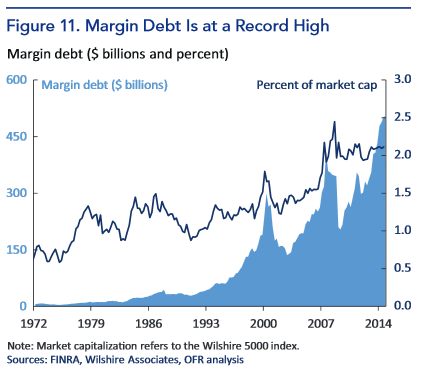 S&P 500 has risen by over 200%, making it the third strongest six year run since the year 1900. 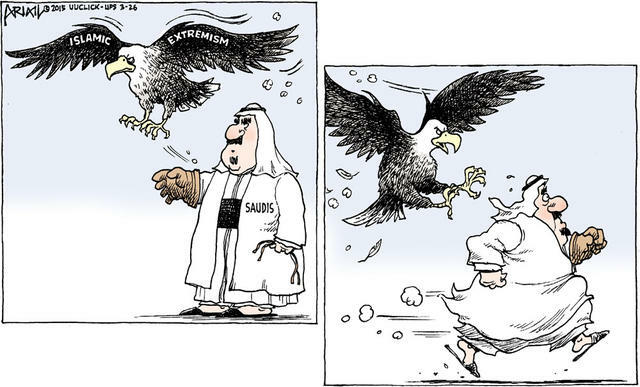 Famously, the two others (1929 and 1999) did not end well. This week has been all about currencies, with a weak euro grabbing the headlines. At one point yesterday morning, the euro was 3% down from last Friday's close, hitting a 12-year low against the US dollar. 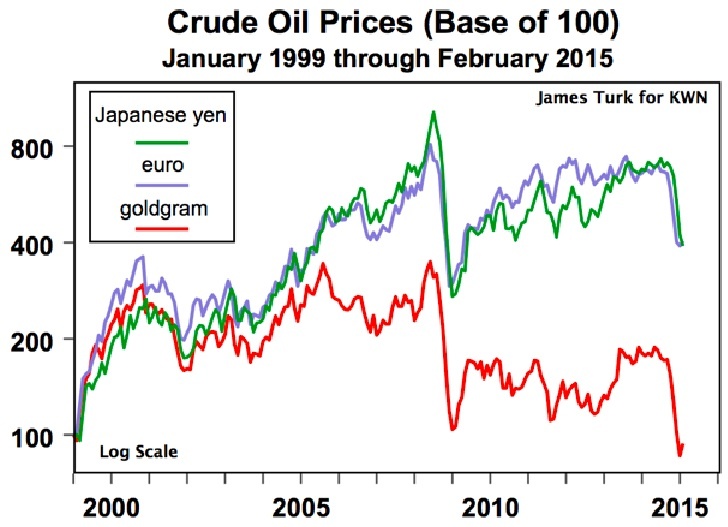 The yen was also weak, challenging its multi-year low point established last December. 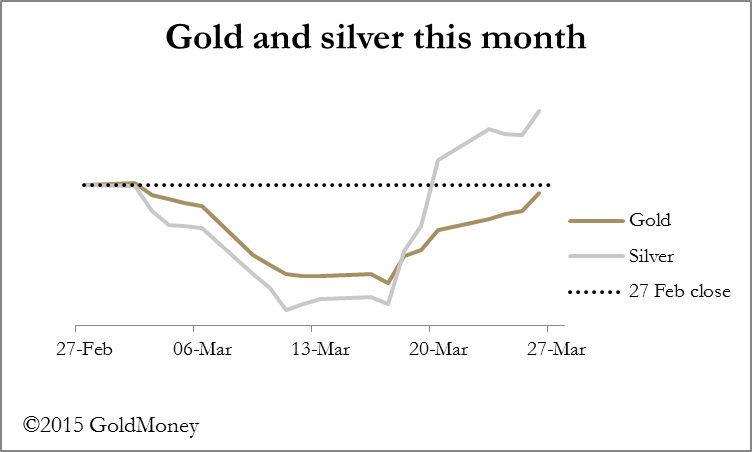 However, there are signs that gold and silver are being accumulated in the futures markets, and at GoldMoney we have seen a pick-up in demand for physical gold this week. Gold fell heavily last Friday by over $35 after overnight prices failed to hold, reflecting a developing bout of dollar strength. 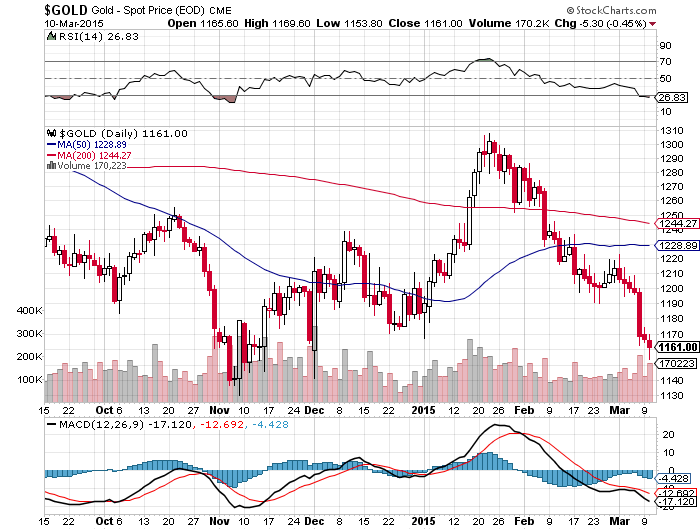 Since then gold has drifted sideways to slightly lower by the close last night, a pattern followed by silver. This month, so far, gold is down 4.5% and silver 6.2%. Since silver tends to move twice as much as gold up or down, this represents a good relative performance for the former. Given the drubbing precious metals have received recently it is a surprise that Open Interest on Comex for both metals is increasing. The next chart is for gold, where this can be clearly seen. The only Comex category which appears to be adding to its longs is "Other Reportables", which includes dealers that don't fit into the other defined categories. Otherwise, Money Managers are adding to their shorts and Producers and Merchants are reducing theirs, which is normal for gold in falling markets. 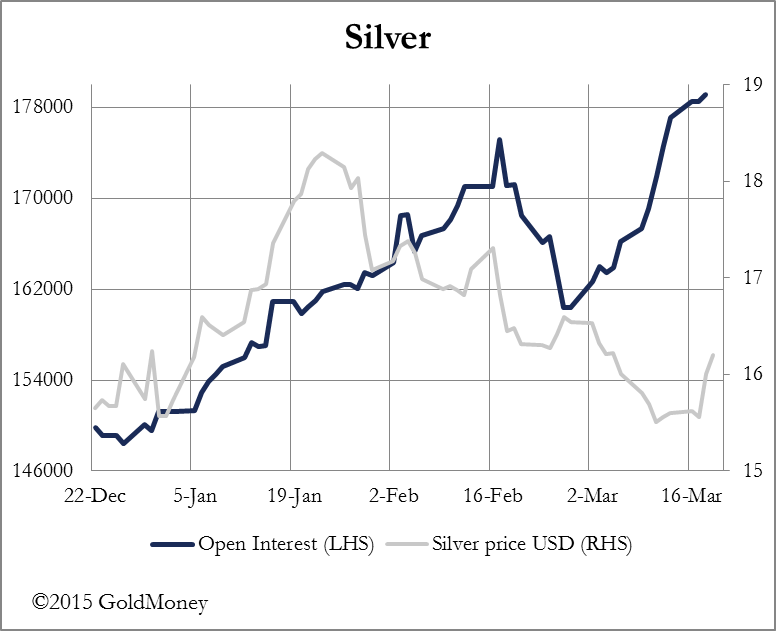 The rise in Open Interest in silver has been more dramatic, which is shown in our next chart. Open Interest is heading back to new highs. Here again, it is the "Other Reported" category that is going long, together with the "Non-reported" category. 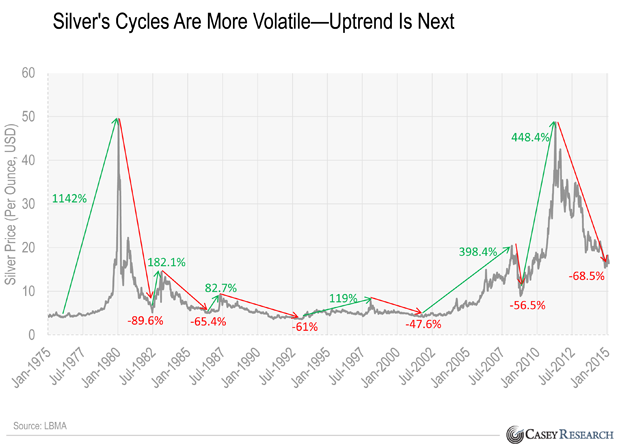 It looks like undefinable parties are accumulating long positions. When Open Interest accompanies a rising price, it indicates healthy buying is present. Conversely, a falling price, which most of the time is through lack of bids, is usually accompanied by falling Open Interest. The relationship between Open Interest and the price is different at turning points, and it looks like that is what's happening. Rising Open Interest on a falling price, which is the condition we have here, indicates increased buying support on falling prices, telling us that the price trend is likely to be on the turn. The bullish implication of this new demand is confirmed by silver showing resistance to further price falls relative to gold: silver should have fallen by about 9%. 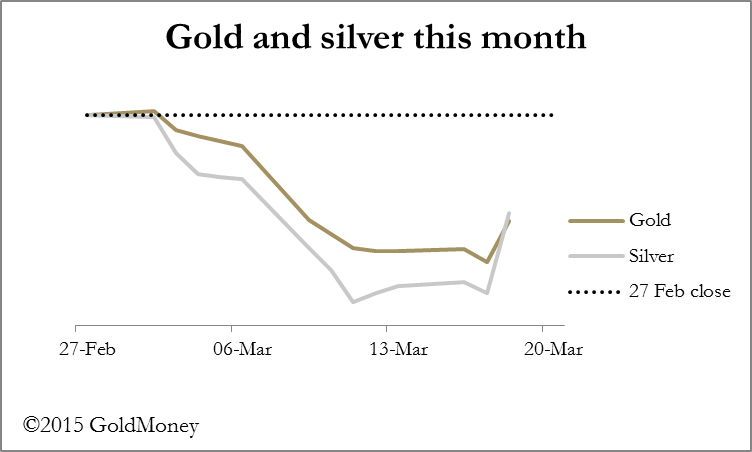 In other news this morning, deliveries from the Shanghai Gold Exchange rose to 44.52 tonnes for the week ending 6th March. 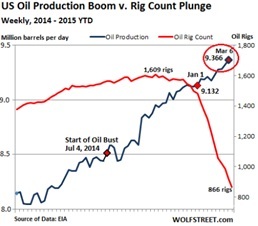 This is more than for the comparable week following New Year in 2014. 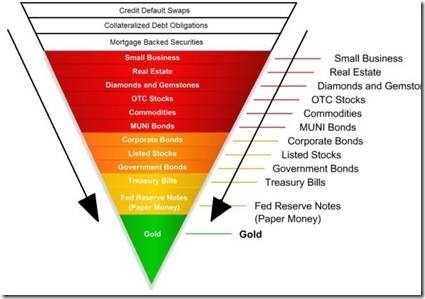 ‘The Fed could make the price stick by buying gold at $2,950 an ounce and selling it at $3,050, in effect becoming a market maker with a 3.3 per cent band around the target price. 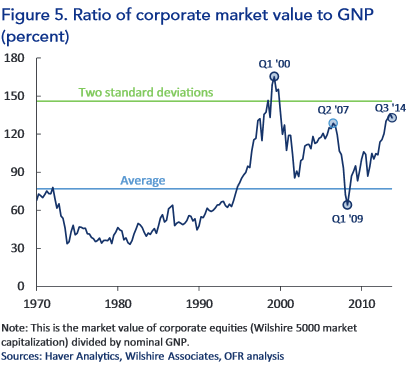 Perhaps that sounds impossible and yet as Mr. Rickards notes: ‘Something similar happened twice in the past 80 years; in 1933-1934 and 1971-1980.’ Will it be different this time? Those were the past two major global financial crises. We are still living in the one that started in 2008. Valuta kriget fortsätter. Sydkorea är nu det 24:e landet som sänker räntan i år. Några charts om Kinas snabbt vikande ekonomi tillväxten är nog ca 3-4% mot den officiella runt 7%. Hur skall USA skapa tillväxt när 80% av befolkningen får sänkta reala löner. 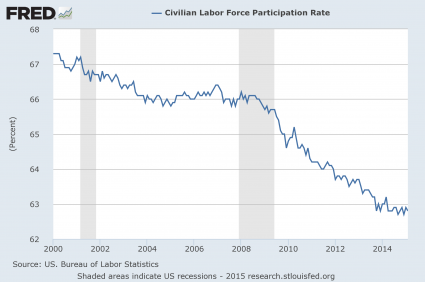 As the BLS reports, not only is the annual wage growth of 80% of the work force not growing, but it is in fact collapsing to the lowest levels since the Lehman crisis! The chart below shows what the implied annual change in supervisor hourly earnings has been since the start of the second Great Depression. 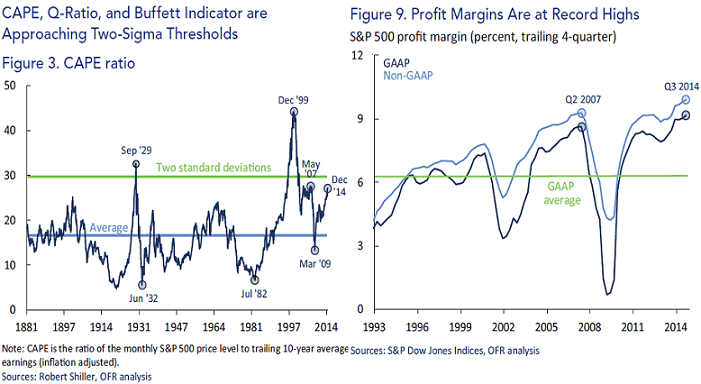 Note the recent differences with the chart immediately above. American economist Lyndon LaRouche issued a statement yesterday urging the Greek government to call the European Union's bluff, and not only exit the Eurozone, but also directly link up with the emerging new global financial and economic system being constructed by the BRICS nations. Ungefär mitten på mars är det dags att köpa guld enligt säsongsmönstret. John Exter´s upp och ned vända pyramid där guldet är fundamentet för den finansiella sektorn. John Exter’s inverted pyramid which is displayed below. Lånekarusellen fortsätter, notera Ryssland som alla bedömer som konkursmässigt. 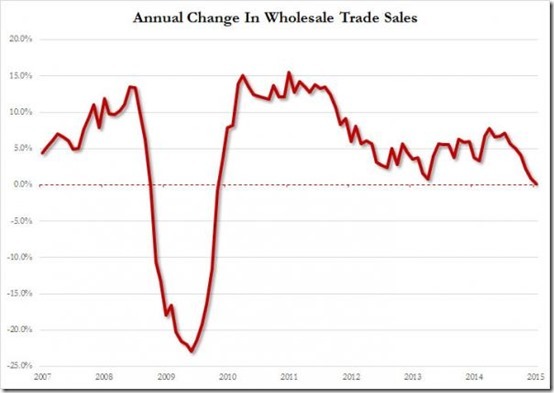 For the first time since Lehman, Wholesale Trade Sales dropped for a 3rd month in a row in January. Plunging 3.1% MoM (against -0.5% expectations), this is the biggest drop since March 2009. Excluding auto sales, wholesale sales fell 3.5%. 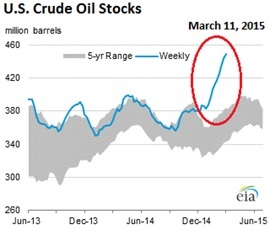 Wholesale inventories rose 0.3% (beating expectations) with only a very modest -0.1% drag from oil. 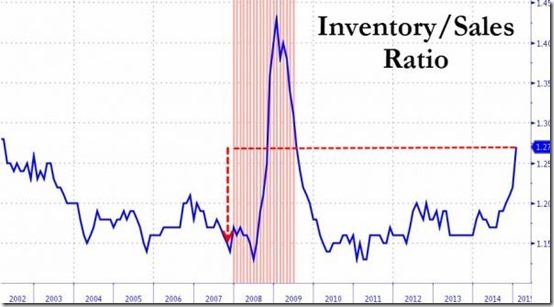 This has sent the inventory-to-sales ratio soaring as the "Field Of Dreams" economy is back – but as one wise trader noted, we are now 10bps higher in inventory/sales than when we entered the recession in Dec 2007. Ryssarna är extremt negativa till USA vilket inte är överraskande men vad kommer det att leda till. Valutakriget fortsätter och bidrar till hög volatilitet vilket kommer att leda till turbulens på andra marknader. Only after the Asian financial crisis in 1997 and the days following the collapse of Lehman Brothers in 2008, have currencies been more volatile, said Bank of America Merrill Lynch strategist David Woo. That measure of volatility is based on a gross-domestic-product-weighted range-based index of currencies of the 20 largest economies in the world, which shows this current bout of currency swings as the third highest in 20 years as the included chart illustrates. “Of course, these two previous episodes were both crisis periods. From this point of view, we can say that currency volatility is the highest for non-crisis periods in twenty years,” the Bank of America strategist said in a note to investors. Woo cautions that the unintended consequence of this type of insidious currency war could lead to greater volatility which in turn could undermine healthy global trade and investment. Dollarn fortsätter att stiga och har på mindre än ett år stigit med mer än 20%. Insiders säljer och bolagen köper tillbaka egna aktier. Någon gör fel frågan är om det är den som får bonus på högre aktiekurser eller om det är bolaget som köper tillbaka högt värderade aktier. Lyssna på Jonathan Cahn om sju års cykler. Boken måste läsas. Vid en studie av 775 fiat valutor konstaterades att den genomsnittliga livslängden för en valuta var bara 27 år. Här är fördelningen vad som hände med papperspengarna. Dagens globala monetära system består av dessa fiat valutor och dom har varit i bruk sedan 1971. Vi har således hållit systemet igång betydligt längre än snittet på ca 27år. Med tanke på att vi har noll ränta och systemet hålls ihop med nytryckta pengar så börjar vi närma oss slutet. Om vi skall tro historien så är det mest troligt att systemet görs om genom krig, inflation eller ett reformerat monetärt system. Vilket det än blir så är det mycket positivt för guld och silver som självklart skall ingå i alla investerings portföljer med minst 10%.